Discussion in 'Feedback Requests' started by FarNorth_Jimmy, Nov 7, 2018. We are Far North Entertainment, a group of five based in Sweden. We have been working together for three years and are currently developing our second game, a sandbox game in a post apocalyptic cyberpunk setting where you explore the world and find materials for crafting tools to help you survive against thousands of zombies! We have been working on this project for about four weeks and have taken inspiration from other games such as Project Zomboid, Terraria and Left4Dead and we are trying to gather feedback to determine in which direction we are taking it. Online Co-op Multiplayer: Team up with your friends, or go solo if you dare! An open world: Explore the world and scavenge it for objects and materials that will help you survive. Crafting: Use acquired materials to forge new weapons and armor or modify your existing arsenal. Build your bases: Build bases of operations where you will be able to craft, plan your next destination or simply catch your breath in between your encounters with the Infected. Hordes of thousands: Thousands of Infected can be simulated on screen at the same time. Make sure you have an escape route or enough ammunition in an encounter, otherwise your death is certain. The gameplay centers around you exploring the world, trying to find and gather materials that can be brought back to your base and be used for crafting tools that will help you survive. Our goal with the Infected is to have a dynamic threat that can create emergent gameplay scenarios where, in one instance a street you cross is completely empty only to be crowded with Infected shortly afterwards, thereby forcing you to plan a different route to circumvent them or try to blast an opening and push through them. This means that communication between you and your friends will be key in order to survive encounters with the Infected. You could have a friend draw the attention of the Infected away from you while you gather resources to take back to the base, or have a friend desperately firing of a shotgun shell, in a small encounter, drawing the attention of a large horde and dooming your entire team. Since we will not post most of our stuff here on Indiegamer to minimize spam, you can follow us on Twitter or Facebook, or join our Discord! We hope you like the game, and look forward to take part of your feedback! Part 4 of our devlog is out! This week will be about new features we implemented last week! For this DevLog we have a couple of new exciting stuff to share! Crafting: we now have a crafting system working in the game. You can craft different tools depending on what materials you come across while exploring. Melee Attacks: we have implemented melee attacks. Melee attacks are meant to be a last resort and only works well against a single zombie, since they are pretty weak. Lasersight: it’s now possible to see where you and other players are aiming. Nasty growls: zombies now make sound! The sound differs if the zombies are just standing or walking around, and if they are chasing you. Death effects: when killed, zombies now burst into flying body parts with trails of blood. Damage effects for players: there is a visual effect, as well as a sound effect, for when you are taking damage. Zombies are now managed by a single script, instead of one script per zombie. We have implemented visual culling, so that only zombies that are in view will be animated. Lots of new stuff this week! We are also working on changing the world system and a map editor! We have released a pre-alpha demo and would love to get some general feedback on the game. Improved visuals and performance: We have lowered the amount of drawcalls and improved the lighting in the game significantly (from about 3500 drawcalls to around 1000). Improvements to animation: Sped up the characters animations for melee attacks and throwing grenades. 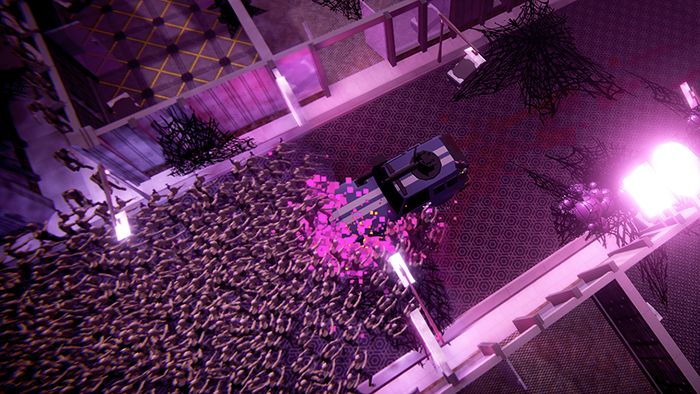 More blood: Zombies now also leave a pool of blood when killed, as do you! We are currently still working on the map editor and getting the open world working. We also have an equipment system in the works. Hope you like the demo, looking forward to your feedback! A new week, a new update! Quite the array of new features have found their way into the game. Check them out below! Map editor: the map editor is almost done! It’s now possible to place details into the game world. Our environment artist has put together a new map, which can be seen in the DevLog (linked below)! Modifiable environment: in addition to the new map editor, it is now also possible to add walls in realtime (will be useful for basebuilding down the line) as well as removing walls, which is currently done by the way of grenades. Equipment system: previously, the player weapons were hardcoded into the game. Now we have an equipment system in place, allowing players to equip two primary weapons (rifles, shotguns etc.) and one secondary weapon (guns, melee weapons etc.). Weapon assembly: not only does the new equipment system allow for equipping different kinds of weapons, each weapon also has its own set of modules that can be customised. These modifications can be things such as different kinds of magazines, stocks, suppressors etc. Volumetric lights: We have implemented volumetric light on the player’s flashlight, creating the illusion that there is fog in the scene which bumps up the atmosphere of the world. The new equipment and weapon modules systems bring a new balance to the game. We can now spawn the player into the world with no weapons at all, so that the player will have to scavenge the world in order to find or craft weapon frames that can be upgraded with different modules. This makes the player very vulnerable in the beginning, which will also make the zombies even more dangerous than before. The modifiable environment also means that, as long as the player has any grenades, they don’t necessarily have to be trapped if they were to escape into a room with only one door.